The ‘726 patent describes a game system in which a player uses a voice input device (ex. a microphone) to give commands which are followed on the screen. The user gives vocal commands based on text which appears on the screen. Once the command is spoken the digital character acts out the player’s command. Another aspect of the invention is that the player can receive instructions or commands from the game in which he must control his character to obey. Thus, the microphone acts as both a way to communicate actions to the character on the screen as well as a way to act out the commands he is given. A game system is provided with a converting means including a voice input member, such as a microphone, for allowing the game player or his/her friend to input voices and for converting the inputted voices into electrical signal data, a sound data storage for storing the electrical signal data obtained by the conversion together with predetermined sound-relating data corresponding to contents of instructions, a sound generator for generating voices from the corresponding electrical signal data when a game player makes a motion in response to the content of instruction, and a device for evaluating a game result based on the content of instruction. Accordingly, a sound output type game system which can provide more interesting and enjoyable games can be realized. 1. 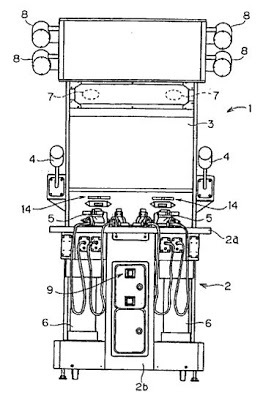 A game system in which a game player makes motions in response to contents of instructions displayed on a display screen, the game system generating predetermined sounds corresponding to the contents of instructions, the game system comprising: voice converting means having a voice input member for inputting voices of the game player in association with a game and for converting the voices input through the voice input member into electrical signal data; storage means for storing the electrical signal data obtained by the voice converting means together with predetermined sound-relating data corresponding to the contents of instructions; motion detecting means for detecting at least one of a hitting motion and a swinging motion of the game player; and sound generating means for generating reproduced voices from the corresponding electrical signal data corresponding to the voices of the game player previously inputted by the game player based on either of the hitting and swinging motions of the game player corresponding to the contents of instructions when the game player makes the motions in response to the contents of instructions.